Sophomore QB Sean Maguire became the starter for Florida State after the Jameis Winston suspension. 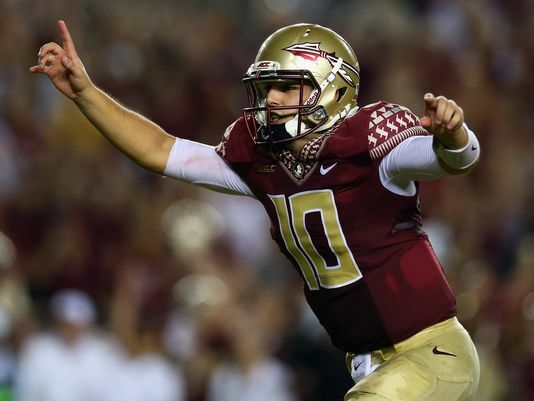 He played just well enough to keep the Seminoles win streak intact. Since I had already written about Florida State this month, my intention was to write about the Auburn and Kansas State game, but how could I not write about the Clemson vs. Florida State game? There was so much drama in this game, it had to be my game of the week. To begin with, there’s the Jameis Winston story (isn’t it always). Winston had been suspended earlier in the week for the first half of this game for yelling an offensive phrase at the campus student union. After further investigation, the school decided to make it a full game suspension. That meant that sophomore Sean Maguire would be starting his first game and it was against an ACC opponent. Luckily it was a home game and he had the support of the home crowd. Maguire started off slowly, got better toward the end and dodged a bullet when his late interception almost cost them the game. In the end he played just enough to keep the Seminoles win streak alive. If you look at the box score, this game looks like a tough, defensive game, but this is a case where stats don’t give the whole picture. Clemson led for the majority of the game, outgained the Seminoles and blew several scoring opportunities. The Tigers missed a 23 yard field goal, a 40 yard field goal and had a horrific shotgun snap from inside the Florida State 1 yard line. The icing on the cake was with 2:14 left. The game was tied 17-17 and Maguire was intercepted by the Tigers. They had the ball at the FSU 26 yard line. However, on the second play, Tiger running back C.J. Davidson fumbled and the Seminoles recovered to force an overtime. Clemson got the ball first in overtime and drove to the Seminole 16 yard line. On 4th down and not trusting their kicker, Clemson coach Dabo Sweeney decided to go for it and the FSU defense held. The Seminoles got the ball in their possession and scored in two plays to get the 23-17 win. It really looked like the Tigers mistakes gave the game away, but you have to give Florida State credit. You don’t go undefeated without stealing a game or two and that’s exactly what they did in this one. Karlos Williams, RB, Sr: Former safety. Big and powerful. Very good short yardage back. Great north – south runner that can make some moves in space. Is a little bit tight hipped, but his size and power make him tough to defend. Good cutback ability. Would be a good running back for a zone scheme because he makes one cut and goes. Patient and sets up blocks well. Keeps knees high. Runs with determination. Led the team with 45 rushing yards on 10 carries and scored the game winning TD in overtime. Also had a 27 yard reception. Mario Pender, RB, RS Soph: Good short yardage back. Carried 8 times for 15 yards and 1 TD (his 2nd of the year). Rashad Greene, WR, Sr: Could have turned pro last year. Has the size to shield off defenders. Good vertical leap. Very good after the catch. Led the team with 9 receptions for 135 yards and had a 74 yard touchdown to tie the game late in the 4th quarter. Also had a 28 yard punt return. Nick O’Leary, TE, Sr: Good route runner that is very good on the crossing pattern. Good on screens. Gives great effort. Determined runner after the catch. Had 6 catches for 77 yards. Cameron Erving, LT, Sr: May not be a left tackle at the next level. Speed rushers give him fits. Vic Beasley made him look really bad at times. Bobby Hart, RT, Sr: Called for two false start penalties. Mario Edwards Jr, CB, Jr: Son of former Cowboys CB Mario Edwards. Very quick off the ball. Puts good pressure on the QB. Had 3 tackles and 1 QB hurry before leaving the game with a concussion. Eddie Goldman, DT, Jr: Fights through double teams. Does a good job shedding blocks. Played better the longer the game was played. Had 2 tackles, 1 tackle for loss, a strip late in the game to force overtime and then a sack in overtime. Reggie Northrup, MLB, Jr: Good run stopper. Had 8 tackles and ½ tackle for loss. Had two big stops, one on 3rd and short to force a punt then teamed with linebacker Chris Casher to make the 4th down stop in overtime. Terrance Smith, OLB, Jr: Very active. Has the strength to stop ball carriers in their tracks. Led the team with 13 tackles, 1 tackle for loss and had a big 3rd down stop that forced a punt. Chris Casher, OLB, RS Soph: Great acceleration. Struggles a bit in pass coverage and needs to learn to look back to avoid pass interference penalties. Had 5 tackles, 1 tackle for loss, 1 sack and teamed up for the 4th down stop in overtime. Was called for a pass interference penalty. P.J. Williams, CB, Jr: Smart and instinctive. Flies to the ball. Knows how to separate the ball with big hits. Had 5 tackles, 1 tackle for loss and had 2 pass breakups. Tyler Hunter, S, Jr: Closes quickly on the ball. A good special timer that downed a punt on the 5 yard line. Had 5 tackles. Was called for a face mask penalty. Cole Stoudt, QB, Sr: Son of former Steelers QB Cliff Stoudt. Patient runner. Inconsistent ball placement. Struggled and was replaced in the 1st quarter. C.J. Davidson, RB, Jr: Track star that came to Clemson on a track scholarship as a long jumper. Surprising physicality for a former track athlete. Runs tough between the tackles. Makes people miss. Has a nice stutter step. Led the team with 54 yards rushing on 12 carries. Had a late fumble that may have cost his team the game. D.J. Howard, RB, Sr: Good leg drive. Good short yardage back. Had only 1 carry for 1 yard, but scored a touchdown. Adam Humphries, WR, Sr: Good concentration and footwork on sideline patterns. Good vertical jump. Able to return punts. Had 2 catches for 20 yards. Charone Peake, WR, Jr: Big play threat. Adjusts well to the ball, especially on low throws. Had 3 catches for 28 yards, but is averaging almost 24 yards per catch for the season. Stanton Seckinger, TE, Jr: Made up for his fumble in last year’s game. Adjusts well to high balls. Made a nice catch along the sideline for 19 yards that was inches away from being a touchdown. Ryan Norton, C, Jr: Had a horrible shotgun snap that went way over the quarterback’s head. That error likely cost his team points since they had the ball inside the FSU 1 yard line. Vic Beasley, DE, Sr: Former running back. Likely too small to play defensive end at the next level, but could be a dynamic outside linebacker, especially in a 3-4 scheme. Tenacious pass rusher that is working to become a complete player. Has a great speed rush. Had 3 tackles, 2 tackles for loss, 2 sacks and a batted pass. Grady Jarrett, DT, Sr: Quick first step. Disruptive. Good inside pass rusher. Had 2 QB hurries and 1 sack. Corey Crawford, DE, Sr: Good motor. Plays to the whistle. Had 3 tackles, 1 ½ tackles for loss, 1 sack. Tavaris Barnes, DE, Sr: Does a good job getting his hands up on pass rush. Good flexibility. Can dip his shoulder to separate from the blocker. Good inside pass rush move. Had 1 tackle, ½ tackle for loss, and 1 batted ball. Stephone Anthony, MLB, Sr: Active player that is always around the ball. Takes good angles. Very good A gap blitzer. Put a lot of pressure on the QB. Great burst. Had a very good game. Had 8 tackles, 2 tackles for loss, 1 sack, 2 QB hurries and a tipped pass that turned into an interception. Tony Steward, OLB, SR: Wraps up well. Able to pressure the QB. Pursues down the line of scrimmage. Had 5 tackles and 1 tackle for loss. Martin Jenkins, CB, Sr: Good speed. Great blitzer. Had 2 tackles, 1 tackle for loss and 1 sack. Gary Peters, CB, Sr: Breaks well on the ball. Active in run support. Had 6 tackles, ½ tackle for loss and 1 pass break up. This entry was posted on September 25, 2014 by draftmaniacs in Scouting reports and tagged 2015 NFL draft, Adam Humphries, Bobby Hart, C.J. Davidson, Cameron Erving, Charone Peake, Chris Casher, Clemson Tigers football, Cole Stoudt, Corey Crawford, D.J. Howard, Dabo Sweeney, Eddie Goldman, Florida State football, Gary Peters, Grady Jarrett, Jameis Winston, Karlos Williams, Mario Edwards Jr., Mario Pender, Martin Jenkins, NFL, NFL Draft, Nick O'Leary, P.J. Williams, Rashad Greene, Reggie Northrup, Ryan Horton, Sean Maguire, Stanton Seckinger, Stephone Anthony, Tavaris Barnes, Terrance Smith, Tony Steward, Tyler Hunter, Vic Beasley.